My cousin Clinton Edward Madsen was born in Denver, Colorado in 1908. His father was John Madsen, an American, and his mother was my aunt Christine Livermore from Clinton, Ontario. They named their son Clinton after the name of the town Clinton. Clinton had one brother Albert and a sister Marguerite. At the age of 32 Clinton was one of the older enlistments at the beginning of the War. 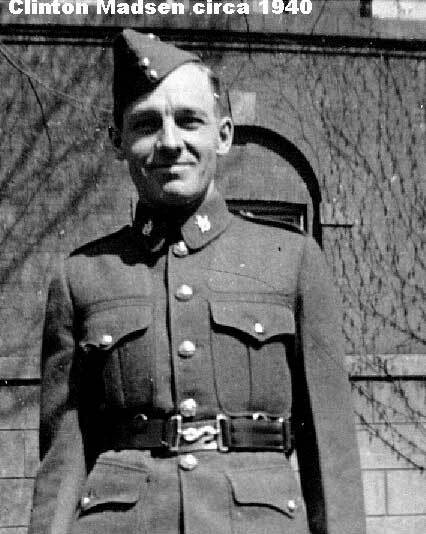 Being employed in a banking environment prior to the War he enrolled in the Canadian Army Pay Corps, which formed part of a group called the Corps of Military Staff Clerks. It was ironic that he should have been one of Canada's first casualties as his employment in the 'Pay' environment should have insulated him somewhat from a frontline risk. Alas it was not to be. Fortunately he had never married. Clinton is remembered on the Halifax Memorial for servicemen lost or buried at sea. Dorothy Flanagan, cousin of Clinton Edward Madsen.